Melodisc is a record label that pops up several times in Enlightenment!- the current edition of YHO which can be downloaded here. I am fascinated by the Melodisc story. I am more fascinated by the fact that it seems really difficult to piece a detailed history together, even though most people who see this will be aware of the label. I get angry when I read about well-connected industry insiders writing books on the history of independent record labels, with an inference that it all started with New Hormones or something. I get just as angry at articles which refer to Immediate or Island being the first independent labels in the UK. But then I really have no idea what the first independent label was because independents have been around ever since there were labels. Melodisc, however, has a pretty unique place in the history of UK independent labels. Hmm, so unique I can’t even see a Wikipedia listing for it. Details of its origins are vague, but the consensus is that it was started in New York by Emil Shalit in the late ‘40s (there are variations of Emil’s name, nationality and the date the label came into being) as the UK arm of his operations. 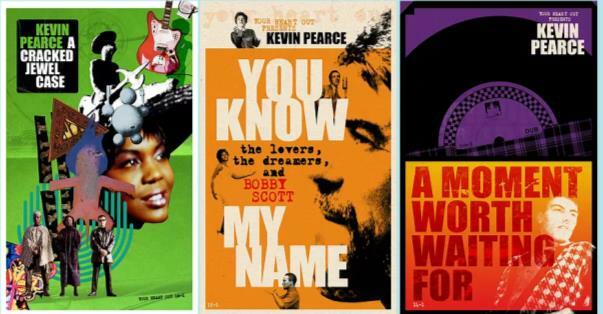 The plan was to license American jazz and blues recordings in the UK, but things developed as opportunities arose to exploit immigrant markets (Caribbean, African, Irish, for example). Jazz musician Jack Chilkes seems to have been in charge of UK operations initially as the label diversified. There doesn’t seem to any doubt about Shalit’s motives. He was an entrepeneur, and willing to exploit any market. But nevertheless his label put out an extraordinary array of music. 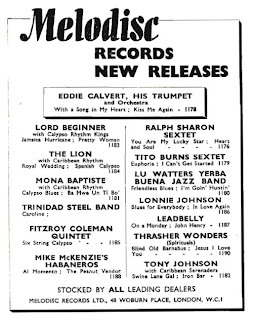 Our hero Denis Preston in the early ‘50s used Melodisc as an outlet for his pioneering calypso recordings, and indeed some of his jazz ones including I believe the first Joe Harriott outing. From catering for the Caribbean market Melodisc moved into the African one. There is a fantastic article online, from an old issue of Musical Traditions, by Ray Templeton, which details the African recordings released in the ‘50s by Melodisc, either made in the UK or imported. Intriguingly there was a strong market in Africa for calypso recordings, and this was something else Melodisc got involved in, particularly around the time Ghana won its independence. It’s hard not to dwell on this, but Melodisc really did put out a mixture of musics that makes you punch the air with glee: folk, country, blues, early rock ‘n’ roll, latin, cuban, TV themes, etc. I guess the label is most famous for its ventures into Jamaican music, with Laurel Aitken, Prince Buster, and the Blue Beat subsidiary. Blue Beat may even be the only case in musical history where a label name has become a description for a particular type of music. There may be many quibbles about its business ethics and the Melodisc way of working, but when you hunt around and look at some of the attempts at discographies that are posted on the web you could almost forgive anything. The Whirlygig ‘50s forum features an extraordinary list of many Melodisc releases, and one of my favourite places on the internet, Tapir’s Reggae Discographies, has great lists featuring a selection of Melodisc singles and LPs. Among the LPs Tapir lists is a Marie Bryant collection. Marie was a singer/dancer from New Orleans who’d worked with Duke Ellington, and been in Nicholas Ray’s They Live By Night, so it’s easy to see why she was pretty popular with guys like Denis Preston when she came to the UK in the early ‘50s. While in the UK Marie recorded with Humphrey Lyttelton, and made a wonderful record with the Mike McKenzie Quintet of Don’t Touch My Tomato, which features in a passage in Frank Norman’s Stand On Me which I couldn’t resist quoting in Enlightenment! Oddly this record by a New Orleans singer and a group led by a Guyanese pianist which was released on a label (Lyragon), a subsidiary of an independent label started by Petula Clark’s dad (Polygon), came to be considered a classic example of Jamaican mento music. The great Phyllis Dillon later did a great rocksteady version of Don’t Touch My Tomato. Incidentally while in the UK Marie appeared in a West End revue and created a worldwide stir by singing an anti-apartheid song that attacked the South African premier. I believe Melodisc used Decca's pressing plant in Lewisham/Lee (haven't tracked down the address yet), so those early ska records were recorded in Jamaica, pressed in SE London, shipped to Jamaica, and some of them ended up being brought back to SE London by Jamaican migrants. You're absolutely right. Wonderful. 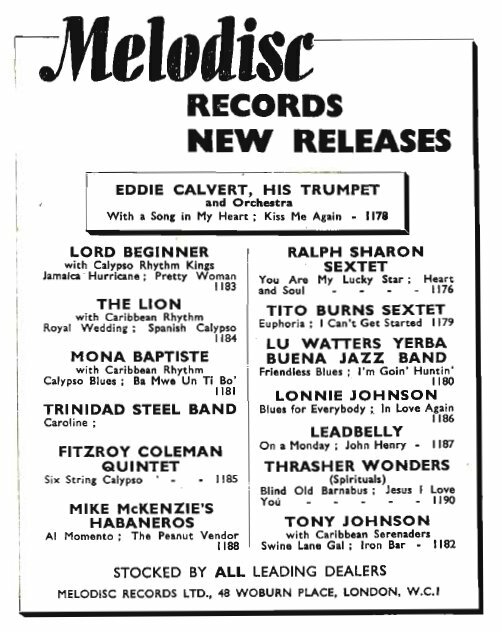 I thought of you when writing about Melodisc as there were early UK calypso collections released on the New Cross label in the late '80s - Port of Spain Shuffle and Caribbean Connection. I am Jayne and daughter of Jack Chilkes. Part 2. Spells with bands of Teddy Foster and (later) Carl Barriteau. Ken 'Snakehips' Johnson's band. Bands of Sydney Lipton and Henry Hall. Influence of certain US jazz records. First impressions of bebop. Record exchange arrangements with people in US. Carlo Krahmer's acetate collection and dubbing facility in his West End basement flat. Began experimenting with bebop at the Fullado Club, closed following police raid (1947). Modern jazz scene continued at Club Eleven. Attitudes to bop. Drink and drug use. Tommy Pollard. Ronnie Scott. Difficulty of making a living from jazz. Need to double on more than one woodwind. Ca. 1949/50 was tricked into forming record company with Emile Shalit, who told Chilkes he owned the rights to material owned by other companies, resulting in legal action. Involvement of Moses Asch and Norman Granz. Chilkes' labels Oriole (initially) then Melodisc. Left business in 1953. Thanks for the tip Jayne. I read about the recording but couldn't get access not being connected to further education, so the contact for Andy is helpful. Steve, those are fantastic stories. Thanks so much. Curious to know what would have been on the Melodisc tapes.